ALPEN Double Planetary Mixers have been meeting the intense mixing needs of the viscous product industries, ranging from Food Products to Cosmetics / Personal Products, from Molding Compounds to fibrous Brake Products, from Butyl Sealants ( liquid ) to Hot-Melt Adhesives. Offered in a variety of MOCs ( all-Stainless-Steel meeting GMP requirement, combinations of SS 316 / SS 304 / CS etc ), the capacities and sizing are largely customized to suit application needs. Blades are offered in several designs, including segmented helix, permitting selection of an appropriate set best suited for the application. The blade design, while being guided by the application dictates for their shape, contour and strength, also takes into account the need for easy dismantling during batch changes or periodic maintenance schedules. Care has been taken to ensure intense radial, axial and cross-flow mixing of the mass during a batch-cycle. Where ALPEN Double Planetary Mixers stand apart from the rest in the market is in its performance. The blades rotate about their respective axis, direction of one opposing that of the other ( our competition offers same-direction rotation of both the blades ), resulting in greater intensity and turbulence during mixing. This in turn results in reduced batch time as well as more homogenous mix per HP consumed. Another area of superior performance is the drive configuration. No belt drives. Higher energy efficiency ( consumed per batch ) has been the hallmark of ALPEN DPMs. The mixing bowls are changeable. The drive assembly is raised along with the blades, on hydraulic columns, for bowl-change or discharge-transfer. The Motor is driven by a variable-speed drive, enabling carefully guided operation every batch, so utterly useful when handling very high-viscosity batches. PLC-based automation of the operation of the DPM is also offered as an option. The operations of the Mixer can be automated too. We can offer PLC-based Automation solutions for your applications involving our Planetary Mixer, in Single or Double configuration. 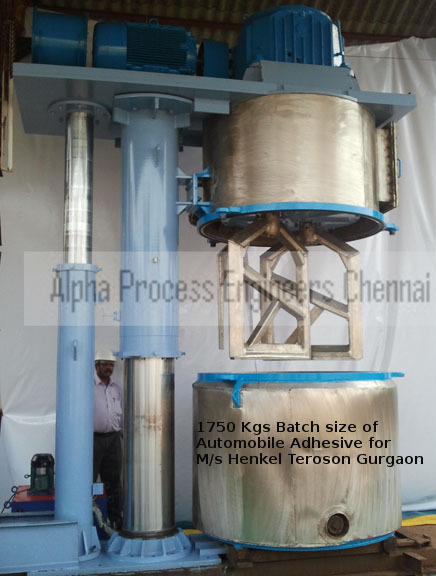 Where the batch is very viscous and not easily dischargeable by other means, ALPEN Pusher Discharge System comes in very handy. Viscous Mixes, produced in ALPEN Planetary Mixers ( Single or Double ) as well as ALPEN Vacuumix, sometimes present difficulty in efficient and clean discharge from the Mixing Can / Vessel. 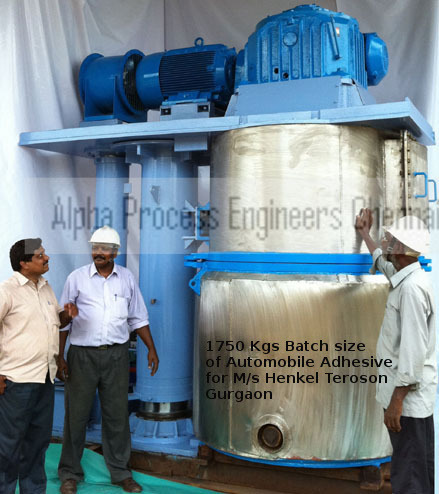 We offer a solution to this sometimes vexing problem – ALPEN Pusher Discharge System. 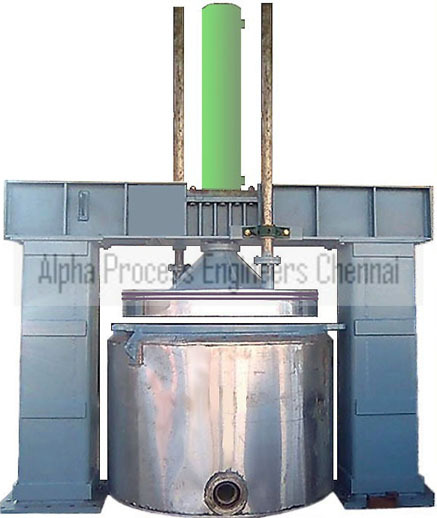 This Discharge System is used to discharge viscous non-flowable materials from the vessel of a Change Can Mixer. A ram, with a vessel-fitting circular Discharge Platen, is slowly introduced into the vessel by means of a hydraulic cylinder. The Platen seals at the vessel walls, ensuring negligible leakage, while advancing into the vessel, simultaneously pushing out the contents of the vessel through a discharge valve located in the bottom of the mix vessel. The discharge rate can be set manually as desired. The residue in the vessel at the end of the discharge stroke of the cylinder is less than 0.5% of the charge volume. The system is rigidly and firmly supported on 2 columns, designed to take care of all possible loads, during the discharge and return stroke of the cylinder. Where required, metering system for controlled and accurate discharge to suit the filling system needs can also be offered. The Discharge Platen MOC can be in SS 304 / 316 for contact parts. Alternately, the same can be hard-chrome plated to suit client need. PLC-based System Automation can also be offered, optionally. 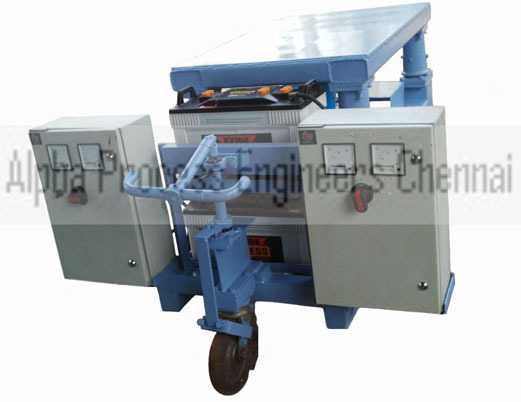 To move vessel between Mixer and Pusher Discharge. Can be supplied in wire-less DC mode or wired AC mode.